This week I am happy to be a featured guest to help launch the 8th Annual Book Marketing Conference, a conference that brings together authors from around the globe. D’vorah interviewed me for an hour about the value of personal branding (which you can listen in to here); in addition, I wrote a blog post as well (which you can read here). This year’s conference, run jointly by D’vorah Lansky (founder of the conference) and Doug Foresta, features a 30-Day Podcasting Challenge for authors and entrepreneurs. I strongly urge you to join the Challenge (you can sign up here at the Silver Level for FREE! 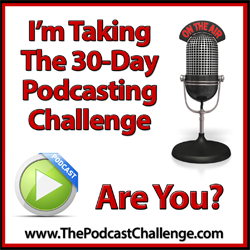 ), because podcasting is a great way to express your personal brand. Podcasting is getting more and more popular all the time, and you can get involved either as a guest on someone else’s podcast or start your own. Here’s to your branding success!